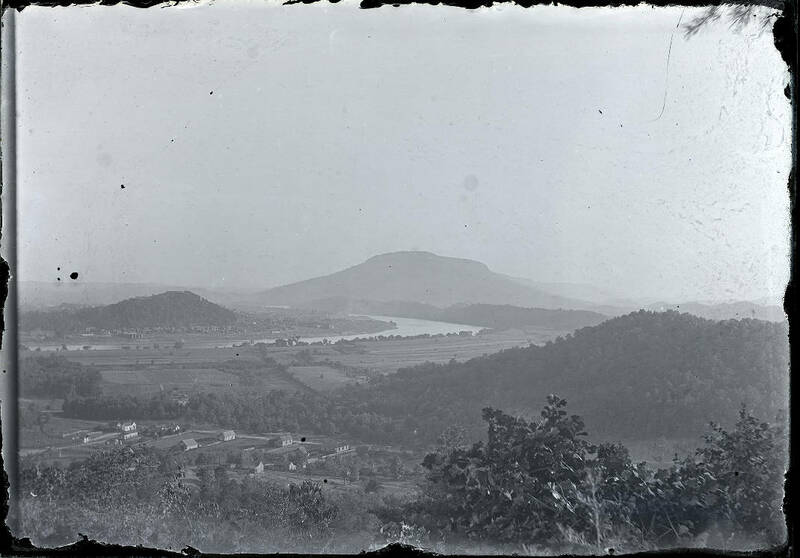 This photo from Picnooga's collection, originally taken in the late 1890s, depicts a view of Lookout Mountain and Cameron Hill. In the 1950s, Chattanooga, like many other cities, sought to revitalize infrastructure and housing neglected during the Depression and World War II. The federal government encouraged cities to demolish older, run-down neighborhoods and business areas to make way for urban development and highways. By the mid-1950s urban renewal and construction of a national interstate highway system were underway. Originally the planned interstate highway bypassed Chattanooga. Realizing the interstate's impact on economic development, Chattanoogans lobbied to change the route. The highway department agreed, but the price was a dramatic alteration of the west side of the city — including Cameron Hill. In November 1955, Mayor P.R. Olgiati announced the Westside Redevelopment Plan, which included 407 acres bound by the Tennessee River plus Chestnut, Carter and West Main streets. There was little opposition except to the Cameron Hill plan, which required destruction of all structures and Boynton Park. Rumors flew as it became evident a portion of Cameron Hill would be topped to make way for the freeway. Olgati attempted to quash speculation that Cameron Hill would be leveled to the Chestnut Street grade by claiming only 15 feet would be removed. In his proposal, the mayor asserted the west side required more in city services than was collected in property taxes. Many of the previously grand homes stood empty, while others were divided into apartments. Furthermore 70 percent of the structures were sub-standard, and 65 percent lacked proper sanitary facilities. The proposal required relocation of 605 families, most of whom had incomes of less than $2,500 per year. All families and businesses were to be moved by June 1, 1958. News Free Press associate editor Kinchen Exum recalled in a 1969 article that when the plans were announced, Hamilton County Historian Zella Armstrong "rushed in to the offices of this newspaper breathless and almost in a state of apoplexy declaring she would throw herself in front of the first bulldozer. Instead, she organized the Cameron Hill Association." Armstrong bombarded the newspapers with articles condemning the plans for Cameron Hill, citing its Civil War history, historic homes and Boynton Park as well as its beauty and tourist potential. The newspapers received letters — both pro and con. Almost everyone had an opinion. Even Ulysses S. Grant III, the president of the American Planning and Civic Association, wrote to Mayor Olgiati in protest. The Cameron Hill Historical Society, led by Armstrong and Sophia Long, included a number of prominent citizens. They met frequently with Olgiati and city officials. The mayor reiterated the need for removing blighted areas as well as balancing historical preservation with economic growth. During one meeting, Armstrong reportedly told the officials, "If you take off the top of Cameron Hill, Chattanooga will rise up and hang you all." The Society proposed a city-wide referendum and filed a lawsuit seeking to buy time to submit an alternative plan; both failed. The federal government's offer of $10 million, matched by $250,000 from the city, stipulated the reconfiguration of Cameron Hill to allow for urban renewal and highway construction. Actually the federal government had quietly purchased much of the west side property before the project started. Eventually about 150 feet of the hill, the height of a 15-story building, was removed. The dirt was used for fill along the interstate and other low-lying areas. Demolition of the homes and removal of the land began in early 1957 and continued for several years. Sophia Long spent the first day of demolition standing on the hill in protest, but no public uprising or hangings occurred. Boynton Park's cannons and plaques were moved to the Chickamauga Battlefield. For a number of years, Cameron Hill sat denuded of trees, and the remaining houses stood vacant. In 1973 Cameron-Oxford Associates purchased the top of the hill and began construction of the Cameron Hill Apartments. A suit brought by the Moccasin Bend Association to halt construction of the 254-unit complex failed in federal court. The apartments opened in 1978. The cannons and plaques returned to the re-established two-acre Boynton Park. The apartments dominated until the hill was purchased by BlueCross BlueShield of Tennessee in 2004. Completed in 2007, the 950,000-square-foot headquarters is home to more than 4,900 employees. Beleaguered Mayor Olgiati asserted, "We cannot make progress for the betterment of the city and its residents without stepping on some people's toes." Indeed, maintaining a balance between preservation and development continues to be the source of discussion and controversy. Gay Moore is the author of several books, including "Chattanooga's Forest Hills Cemetery" and "Chattanooga's St. Elmo." For additional information, contact chattahistoricasso.org.